Products from Meissen's home collection and other ranges. In the last two months, I have attended two giant, international trade shows: the Ambiente Trade Show in Frankfurt, Germany and the Architectural Digest Home Show here in New York City. And I am not done yet. Before I head out on another trip-- this time to Milan for Salone de Mobile--here are the best new interior design products from those shows. The stuff I report on here is truly cutting edge. There are brand new introductions and you will be the first to know what fantastic items are coming soon to US shores. Keep clicking through the slideshow! For fine porcelain connoisseurs, you can't beat the German company Meissen. 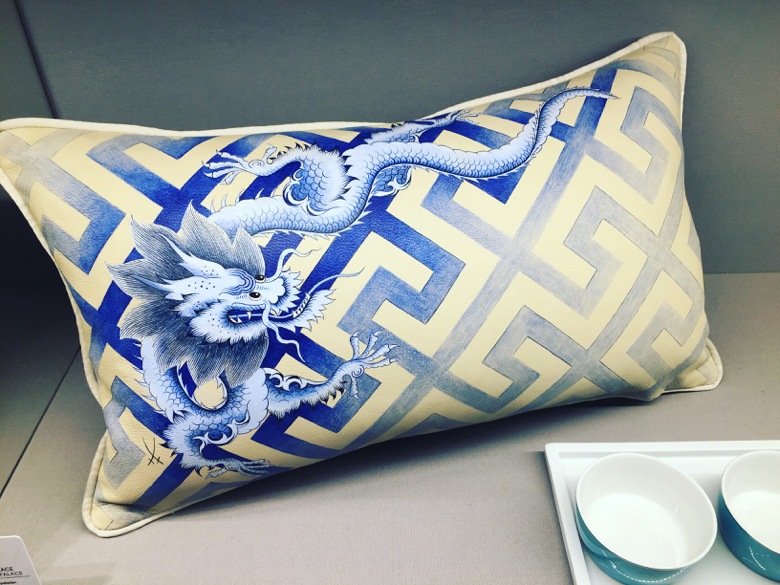 What you may not know, and what I learned in Frankfurt, is that they offer a full range of home products, including lamps and chandeliers, fabrics, rugs and, my personal favorite, hand painted leather pillows like the one shown here. Meissen draws all of its designs from it's rich historical archives that stretch back to 1710. For tomorrow's fine porcelain classics, turn to the work of Stacy Cushman, whose wares have been exhibited at the Cooper Hewitt. Cushman creates stunning handbuilt and individually painted and glazed porcelain vessels and objects. She strives to create abstracted visions of the sea, water and earth that can be installed as sculpture, and, like this design, is sometimes shaped into lamp bases. Find Stacy Cushman and her work at Cocobolo Design. Bespoke commissions also are available. I was the first to report that textile designer and founder, Brit Kleinman of Avo, purveyor of hand painted hides was developing leather wall tiles. The tiles were ready for launch at this year's Architectural Digest Home Show and they are stunning. Brit's fabulous pillows, and wonderful leather upholstery also are shown. RiccioCaprese can trace its roots back to 1897, but it's recent designs are inspired by the island of Capri. 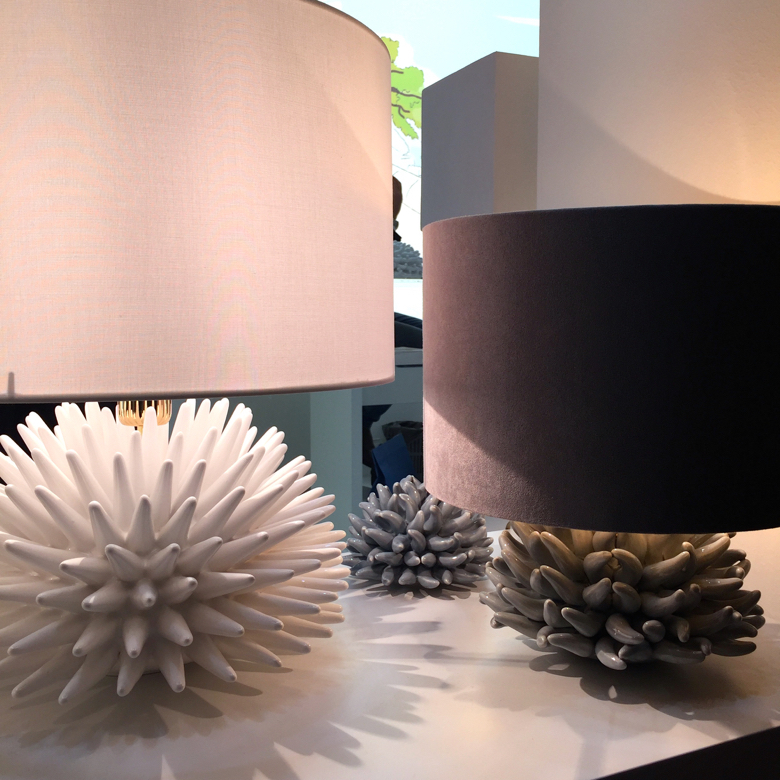 Loosely recalling sea urchins, it's ceramic lamps make a unique statement. Coming soon to stores in the USA, Born in Sweden rugs are made from the finest New Zealand wool and linen in a flat weave. The bold and graphic colors are designed to be long lasting and are sure to bring a smile. Already available on this side of the pond, New York rug company Nasiri has introduced a Mid Century Modern collection of flat weave carpets in more neutral, quieter tones. The collection, made from wool, cotton and goat hair, was culled from hundreds of vintage rugs and is exclusive to Nasiri. The vintage rugs were woven after 1920, and Nasiri's craftsmen can recreate the look to fulfill custom needs. An Ambiente discovery, StoryTiles are whimsical, miniature pieces of art designed by Marga van Oers based on old Dutch white tiles. Made in Holland, van Oers breathes new life into her designs with humorous details--each tile tells a story. Utterly charming. Bold color was seen both here and abroad. One example from the Architectural Digest Home Show are the brightly colored pillows and table textiles from Fort Makers, an artist collective. Fort Makers is inspired by the Bauhaus to make functional and interactive art--everything is handpainted in Brooklyn. 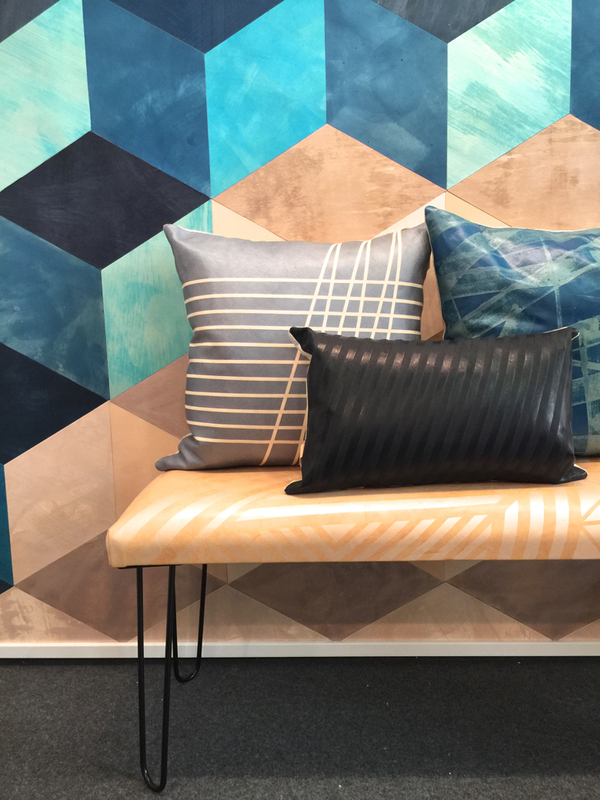 Spotted at Ambiente in Frankfurt, the graphic and vivid knit blankets and throws by Anna Gitelson-Kahn are made in Tel Aviv from fine merino wool. Molecular motifs were popular at both trade shows. German company Eichholtz offers their Galileo coffee table featuring an atomic base, while here in New York, Rosie Li Studio ( a partnership between an designer and an engineer), offer lighting whose design is driven by science and mathematics. The products presented by Kinder Modern were among the most delightful and creative offerings for children that I have seen in some time. Photo credits: First image. StoryTiles from their website. Anna Gitelson-Kahn from her website. All other photos by Lynn Byrne for Decor Arts Now.